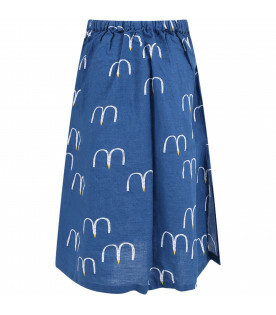 Color: Light blue -Description: Color block skirt with three front pockets, adjustable waistband thanks to inside elastic with buttons, four back pockets and closure with botton and zip, on the front. It is embellished with white logo, on the back. -Details: 100% Cotton. Machine wash at 30°C. 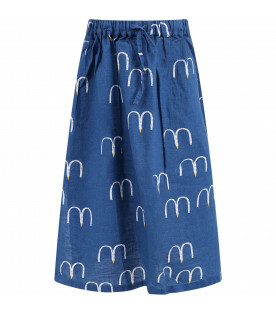 Color: Blue - Description: Blue skirt, made from cotton, with side inseam pockets, closure with zip and button, elastic waistband on the back; it is embellished with blue, red and white side stripes, made from pettersham. - Details: 98% Cotton 2% Elastan. Dry clean only. 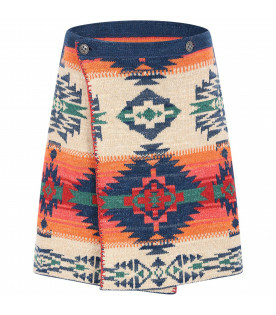 Color: Blue -Description: Blue skirt with zip closure, on the back; it is embellished with bronze details, on the front and on the back and blue embroidered logo, on the front. - Details: 41% Cotton 41% Modal 10% Elastane 8% Polyamide. Machine wash at 30°C. 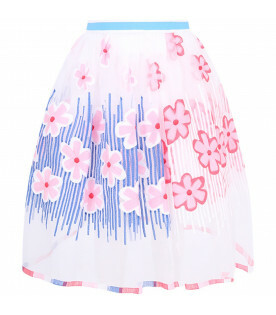 Color: White -Description: White skirt with gathereing and frilled flounce below, adjustable waistband thanks to inside elastic with buttons and closure with invisible zip on the back. 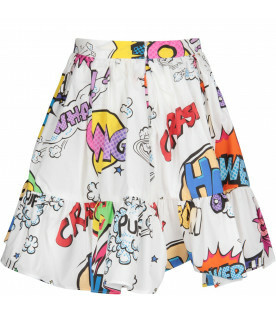 it is embellished withcolorful all-over logo, writing and heroS. -Details: 100% Cotton. Machine wash at 30°C. 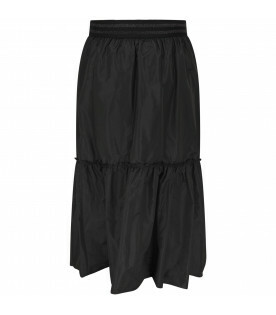 Color: Black -Description: Black long skirt with elasticized waistband and flounce, on the bottom. - Details: 100% Polyester. Machine wash at 30°C. 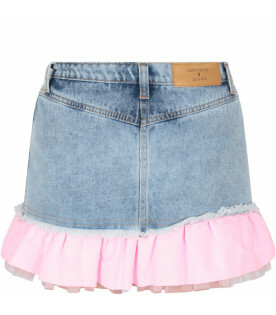 Color: Light blue -Description: Light blue denim skirt with button and zip closure on the front and three pockets. 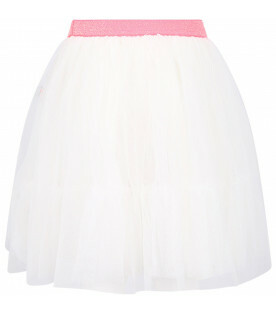 It is embellishd with neon pink writing and pink and tulle details on the hemline. - Details: 100% Cotton. Dry clean only. 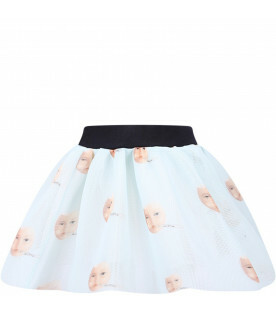 Color: Grey -Description: Grey skirt rt with elasticized waistband and coulisse. 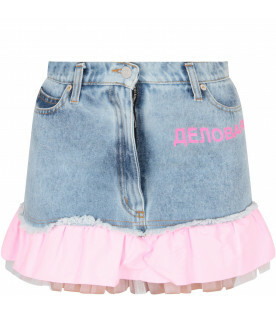 It is embellished with pink rubberd logo, on the one side. - Details: 100% Cotton. Machine wash at 30°C. 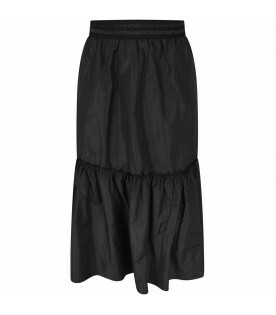 Color: Black -Description: Black skirt with elasticized waistband and ruffles on the bottom. 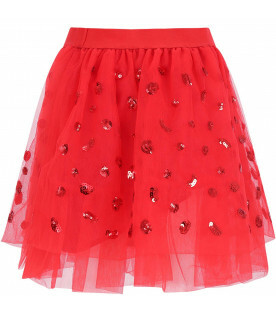 It is embellished with white all-over polka-dots and white embroiderd logo and lips, on the bottom. -Details: 96% Cotton 4% Elastan. Machine wash at 30°C. 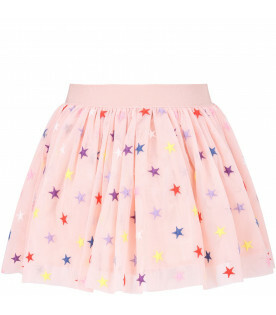 Color: Pink -Description: Pink five pocked skirt, with closure with zip and press-stud, on the front; it is embellished with frayed details and iconic metallic D on the back. -Details: 98% Cotton 2% Elastan. Machine wash at 30°C. 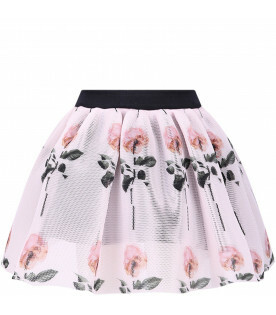 Color: Pink -Description: Pink skirt with black elastic waistband and soft transparant and perforated honeycomb structured fabric. 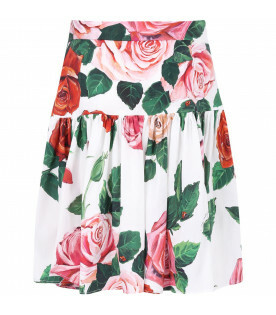 All-over colorful Rose printed. - Details: 100% Polyester. Machine wash at 30°C. 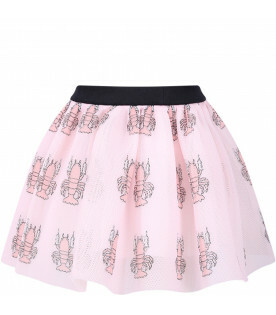 Color: Pink -Description: Pink skirt with black elastic waistband and soft transparant and perforated honeycomb structured fabric. All-over colorful lobsters printed. - Details: 100% Polyester. Machine wash at 30°C. 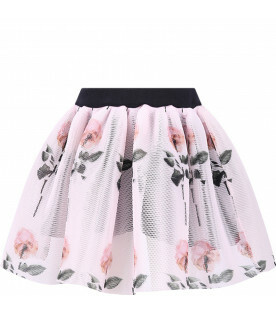 Color: Pink -Description: Pink skirt with black elastic waistband and soft transparant and perforated honeycomb structured fabric. All-over colorful cats printed. - Details: 100% Polyester. Machine wash at 30°C. Color: Aquamarine -Description: Aquamarine skirt with black elastic waistband and soft transparant and perforated honeycomb structured fabric. All-over colorful eggs printed. - Details: 100% Polyester. Machine wash at 30°C. Color: White -Description: White skirt with black elastic waistband and soft transparant and perforated honeycomb structured fabric. All-over colorful horses print. - Details: 100% Polyester. Machine wash at 30°C. 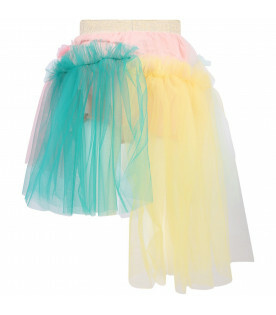 Color: Multicolor -Description: Color block tulle skirt, with pink muslin, gold lurex elasticized waistband and asymmetrical roundness. 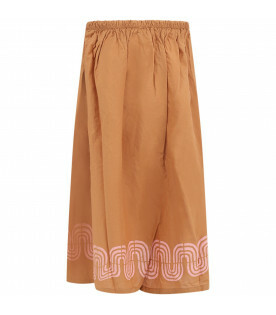 -Details: 70% Cotton 30% Silk. Machine wash at 30°C. 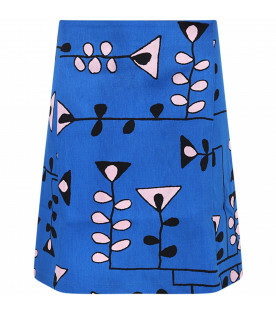 Color: Royal blue -Description: Royal blue skirt, made from cotton, with zip closure, on the back. 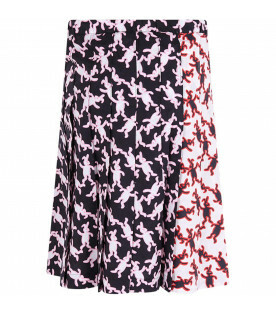 It is embellished with pink and black all-over prints. -Details: 100% Cotton. Machine wash at 30°C. 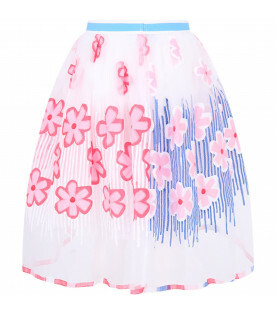 Color: White -Description: White midi skirt, made from tulle, with light blue and white elasticized waistband; it is embellished with colorful embrideredd flowers and details and pink, red and white hemline. -Details: 100% Polyester. 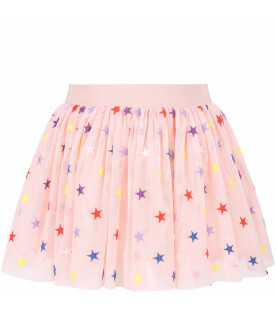 Hand wash.
Color: Pink -Description: Pink glittery hard tulle circle skirt with colorul elastic waistband. Sequins, float around between tulle layers. 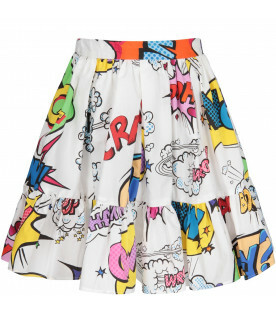 It is embellished with colorful all-over patches. -Details: 100% Polyester, lining 100% Cotton. 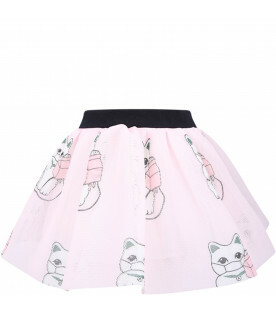 Machine wash at 30° C.
Color: Pink -Description: Pink skirt with gathereing and frilled flounce below, adjustable waistband thanks to inside elastic with buttons and closure with invisible zip on the side. 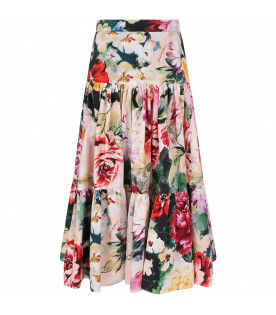 it is embellished with colorful poppies and black logo all-over. -Details: 100% Cotton. Machine wash at 30°C. 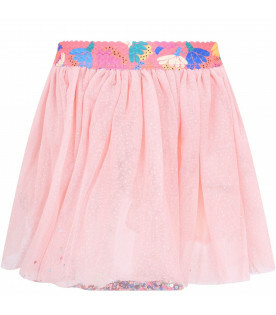 Color: Pink -Description: Pink midi pleated lurex skirt, with colorful lurex elasticized waistband and pink petticoat. 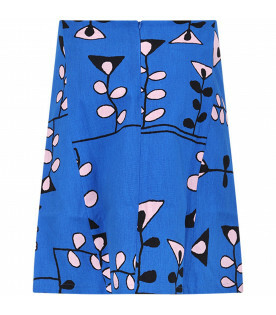 It is embellished with azure all-over double iconic GG. -Details: 64% Polyester 21% Viscose 15% Silk. 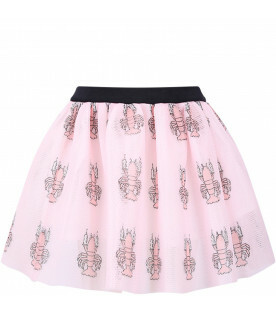 Hand wash.
Color: Pink -Description: Pink midi skirt, made from tulle, with pink and red lurex elasticized waistband and petticoat. 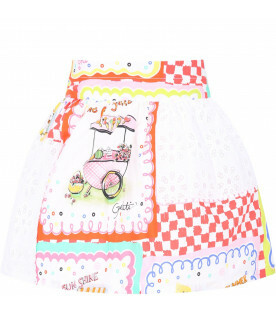 It is embellished with pink embroidered double iconic GG all-over. -Details: 100% Polyamide. 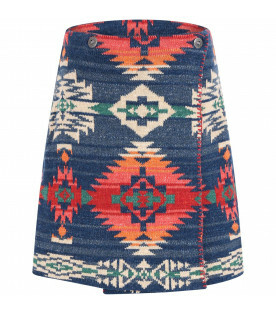 Hand wash.
Color: Blue -Description: Blue denim five pocked skirt with button and zip closure, on the front. 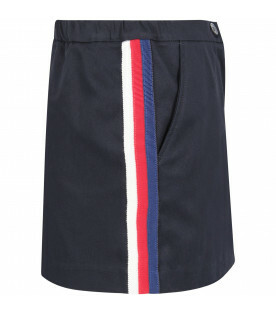 It is embellished with white all-over and white patch with logo, on the back. -Details: 100% Cotton. Machine at 30°C. 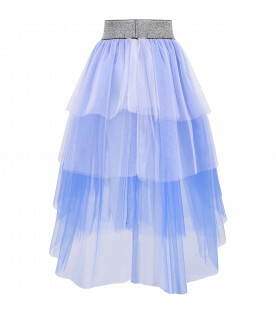 Color: Light blue and blue -Description: Light blue to blue degradè skirt, made from tulle with silver lurex elastic waistband. 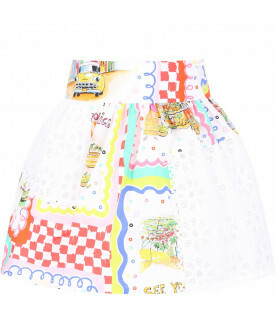 It is embellished with colorful patch shaped like heart. 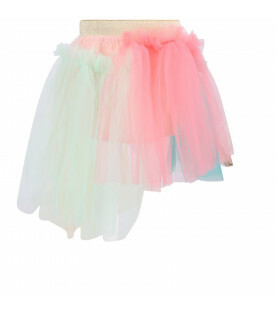 - Details: 100% Tulle. 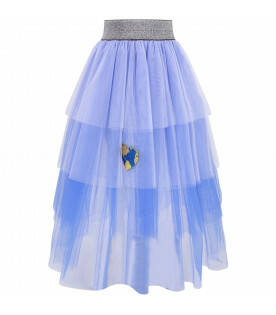 Color: Blue -Description: Blue tulle tutu, with white elasticized waistband with orange logo. 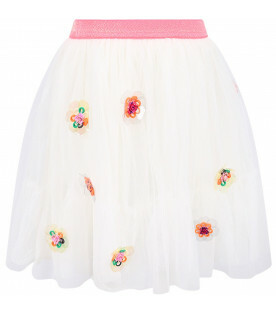 It is embellished with colorful all-over pom-pom. -Details: 100% Tulle. 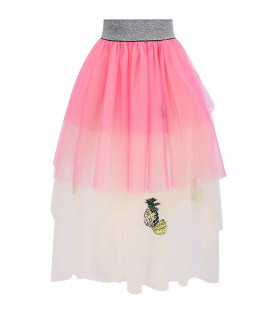 Color: Pink and ivory - Description: Pink to ivory degradè skirt, made from tulle with silver lurex elastic waistband. 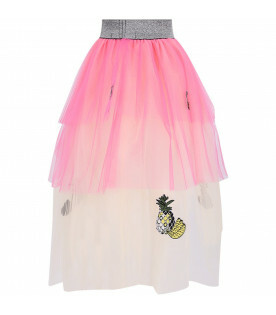 It is embellished with colorful patches shaped like pineapples. - Details: 100% Tulle. 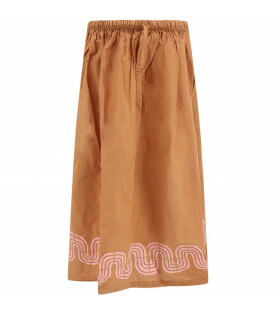 Color: Ochre - Description: Ochre long skirt, made from organic cotton, with elastic waistband and side rips; it is embellished with pink waves on the bottom. This garnment belongs to "To Make a Garden" collection, a call for saving honeybees by plating gardend everywhere, everytime. - Details: 100% Organic cotton. mMchine wash at 30°C. 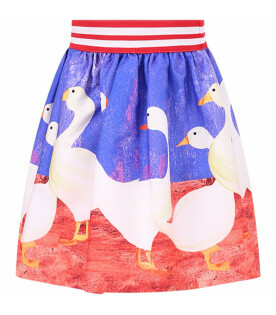 Color: Blue - Description: Blue long skirt, with elastic waistband and side rips; it is embellished with all-over seagulls. This garnment belongs to "To Make a Garden" collection, a call for saving honeybees by plating gardend everywhere, everytime. - Details: 78% Cotton 22% Linen. Machine wash at 30°C. 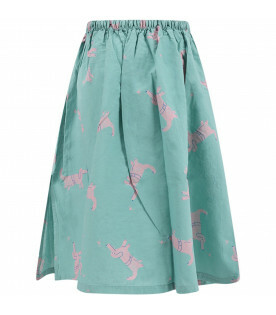 Color: Green - Description: Green long skirt, made from organic cotton, with elastic waistband and side rips; it is embellished with all-over print with pink duchshunds. This garnment belongs to "To Make a Garden" collection, a call for saving honeybees by plating gardend everywhere, everytime. - Details: 100% Organic cotton. mMchine wash at 30°C. 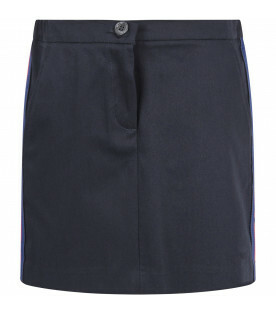 Color: Black -Description: Black denim skirt, with belt loops, adjustable waistband thanks to inside elastic with buttons and closure with silver zip, on the front. It is embellished with red and black gros-grain belt with white logo and orange embroidered arrow, on the back. - Details: 99% Cotton 1% Elastan. Machine wash at 30°C. 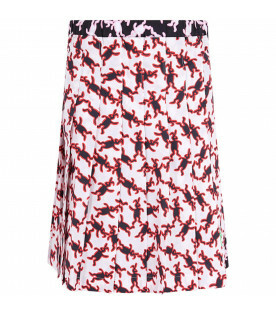 Color: Black -Description: Black pleated skirt with red and white elasticized waistband and closure with zip, on the side. 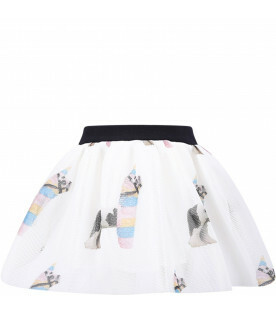 It is embelliished with white all-over logo on the elastic. -Details: 100% Polyester. Machine wash at 30°C. 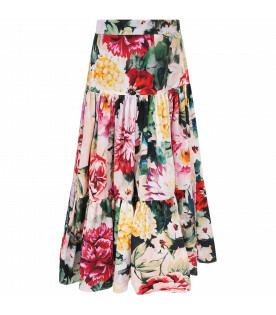 Color: White -Description: White skirt with gathereing and frilled flounce below, adjustable waistband thanks to inside elastic with buttons and closure with invisible zip on the back. 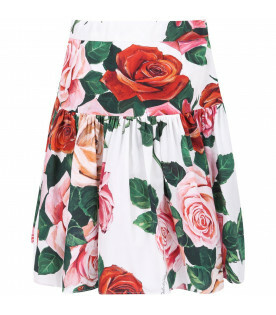 it is embellished with colorful roses and black logo all-over. -Details: 100% Cotton. Machine wash at 30°C. Color: White -Description: White skirt with adjustable waistband thanks to inside elastics with buttons, closure with side zip and voluminous skirt, with underskirt made from tulle and cotton muslin. 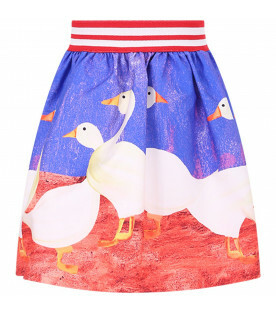 It is embellished with coloful print and San Gallo lace details. -Details: 100% Cotton. Machine wash at 30°C. 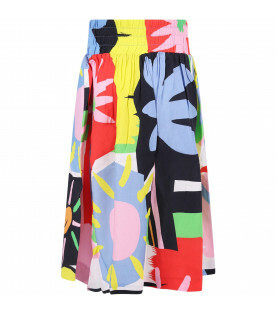 Color: Multicolor -Description: Colorful midi skirt with elasticized wiastband and side pockets. 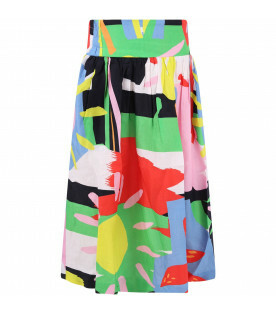 It is embellished with colorful all-over print. -Details: 100% Viscose. Machine wash at 30°C. 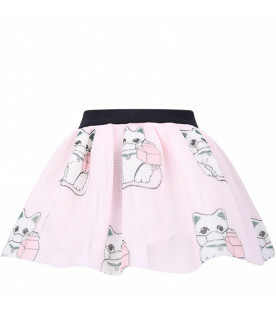 Color: Pink -Description: Pink, white and red pleated skirt, with black elasticized waistband, embellished with white logo. -Details: 100% Polyester. Dry clean only. 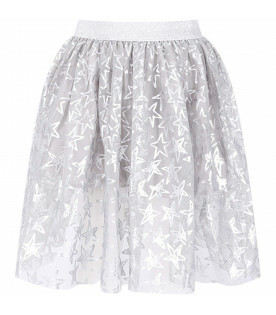 Color: Grey -Description: Grey tulle skirt with silver elasticized waistband. 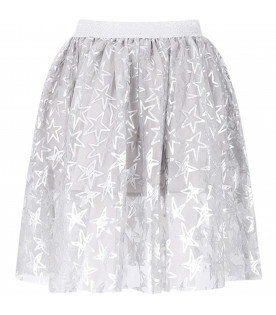 It is embellished with silver all-over stars. -Details: 100% Polyester. Machine wash at 30°C. 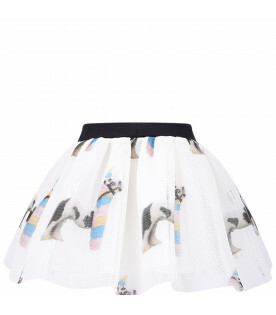 Color: White and black -Description: White and black skirt with elasticized waistband; made from cotton. 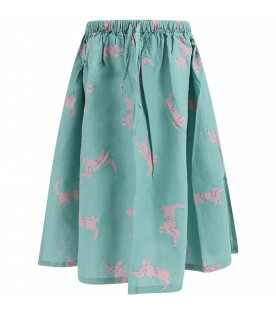 It is embellished with colorful all-over rabbits, in contrasting and green patch shaped like rabbit. -Details: 100% Cotton. Machine wash at 30°C. 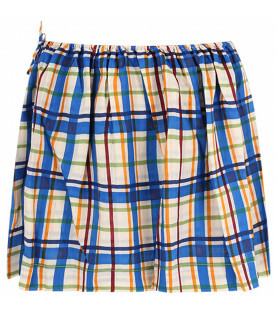 Color: Multicolor -Description: Colorful checked skirt with elasticized waistband. It is embellished with smaall bow applied on the front. -Details: 100% Ramiè. Machine wash at 30°C. 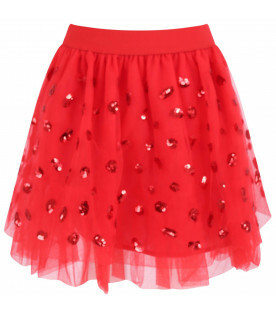 Color: Black -Description: Red skirt with elastic waistband, from tulle and it is embellished with red embroidered sequins all-over. -Details: 100% Polyester. Machine wash at 30°C. 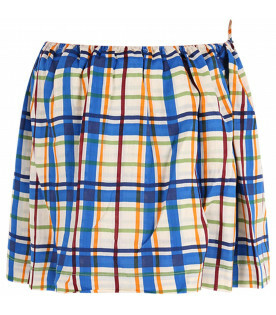 Color: Multicolor -Description: Colorful jaquard reversible skirt, with closure with buttons on the front. - Details: 100% Cotton. Machine wash at 30°C.